A look at retrospective quantitative data of 560 patients with diabetes (who presented to primary treatment center - Arogyadhama, Prashanti, SVYASA, Jigani between 2008 and 2010) who underwent the IAYT helps us further understand the workings of this model. The patients stayed for a minimum of 6 days to a maximum of 15 days (mean [standard deviation] duration of in-patient stay: 12.38 [6.10] days), during which the IAYT for diabetes was imparted to them. The four important factors that could affect their diabetes status: (1) Medication compliance, (2) diet, (3), stress and (4) adherence to yoga, were monitored and controlled. Medication compliance and adherence to yoga was controlled by the medical doctor and yoga therapist in-charge in the section; diet was controlled as standard saatvik food is usually provided at Prashanti, SVYASA to all patients admitted; the ambience of Prashanti campus (away from city life, silence and amidst nature) could be considered as a calming factor to combat stress. Assessment and analysis of diabetes related parameters in the above mentioned controlled environment showed that though the baseline values of all variables were not normally distributed (P < 0.01), nonparametric test analysis of pair wise time effect using the Wilcoxon signed ranks test showed a significant improvement in respiratory rate, pulse rate, systolic blood pressure, diastolic blood pressure, weight, breath holding rate, fasting blood sugar (FBS), and postprandial blood sugar (PPBS) from before yoga to after yoga practice [P < 0.001, [Table 1]. A number of studies conducted in India have shown that yoga practice improves weight, blood pressure, insulin, triglycerides,  blood pressure, , FBS and PPBS levels, , pulse rate. In most of the above studies the period of yoga intervention was anywhere between 40 days to a maximum of 90 days to observe the desired effects. The yoga intervention also differed from Hatha yoga to Yoga nidra. The fact that in our study we have observed changes in all outcome variables after 2 weeks of in-patient stay shows that the IAYT is effective in the treatment of diabetes - where all the components of the IAYT model are integrated and provided to have a desired effect on each of the five levels of existence in a controlled and monitored environment - asanas and pranayama comprise only a minuscule part of the entire program. In this context, in most of the above research studies, yoga was possibly equivalent to "asana, pranayama and/or meditation practice." Hardly any studies mentioned controlling for extraneous factors which could have status played an integral role in the effectiveness of the program (diet, stress and medication compliance). The challenge would be to replicate this holistic model of IAYT for diabetes actively in community and out-patient settings, as it would require controlling for medication compliance, adherence to yoga and stress in a nonresidential set-up. A three-arm randomized controlled study with: (1) In-patient IAYT model, (2) out-patient IAYT model and (3) control group could be an important and interesting step in understanding the factors determining effectiveness and replicability of the IAYT model in the Indian community setting, which in turn would help reduce the overall burden of diabetes in Indian community. 1. Villacres MC, Jagannathan A, Nagarathna R, Ramakrsihna J. Decoding the integrated approach to yoga therapy: Qualitative evidence based conceptual framework. Int J Yoga 2014;7:22-31. 2. Nagarathna R, Nagendra HR. Integrated Approach of Yoga Therapy for Positive Health. Bangalore: Swami Vivekanand Yoga Prakashana; 2004. 3. Yang L, Brozovic S, Xu J, Long Y, Kralik PM, Waigel S, et al. Inflammatory gene expression in OVE26 diabetic kidney during the development of nephropathy. Nephron Exp Nephrol 2011;119:e8-20. 4. Cohen RM, Smith EP. Frequency of HbA1c discordance in estimating blood glucose control. Curr Opin Clin Nutr Metab Care 2008;11:512-7. 5. Kerr D, Gillam E, Ryder J, Trowbridge S, Cavan D, Thomas P. An eastern art form for a western disease: Randomised controlled trial of yoga in patients with poorly controlled insulintreated diabetes. Pract Diabetes Int 2002;19:164-6. 6. Amita S, Prabhakar S, Manoj I, Harminder S, Pavan T. Effect of yoga-nidra on blood glucose level in diabetic patients. Indian J Physiol Pharmacol 2009;53:97-101. 7. Singh S, Malhotra V, Singh KP, Sharma SB, Madhu SV, Tandon OP. 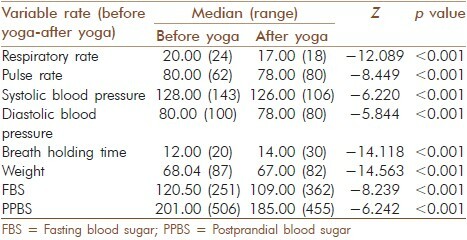 A preliminary report on the role of yoga asanas on oxidative stress in non-insulin dependent diabetes mellitus. Indian J Clin Biochem 2001;16:216-20.